Senior Leaders at two Multi-Academy Trusts, working with the Regional Schools Commissioner, are setting out a new vision for inter-trust relationships and collaboration. 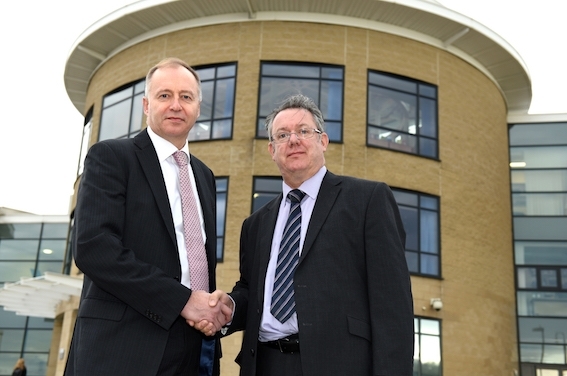 Paul Tarn, Delta Academies Trust (left) and David Gurney, Cockburn Multi Academy Trust, pictured at South Leeds Academy. These proposals would see The South Leeds Academy, part of Delta Academies Trust, join the nearby Cockburn Multi-Academy Trust. Delta (formerly the Schools Partnership Trust) has been the sponsor since South Leeds became an academy in 2009. As South Leeds Life reported, the school’s latest Ofsted report in January this year recognised progress but still rate the school ‘inadequate’. Cockburn School’s headteacher David Gurney has recently been appointed a National Leader of Education. “Delta Academies Trust’s overarching vision is to be part of a Northern Alliance of outstanding multi-academy sponsors capable of working together to transform education for children in the region. Delta is committed to a model of system leadership that will enable Trust leaders to work collaboratively, supporting each other and strategically identifying where each of us can make a difference. “Ofsted recently recognised the huge improvements at South Leeds, and we are confident that this summer’s results will reflect this. Staff and students at South Leeds are relentless in their determination to drive up standards and continue to transform the academy. “It is a priority for both Cockburn and Delta to make sure that the young people across south Leeds achieve the highest levels of academic success. Everyone wants the very best education for their children. “We would work carefully together to ensure that there is a smooth transition for all stakeholders. Our shared vision focusses on achieving a positive outcome for the current and future students at The South Leeds Academy. “The fundamental aim of the academies programme is to drive up standards of education for all children. “The CEOs and Boards of both Trusts have been looking at how they can play a strategic role in driving up standards for children in the local community. “As an RSC, it is refreshing to see how MATs can work together and recognise their mutual strengths. “Cockburn and Delta have a great working relationship which they are using to work collaboratively to support children. “Cockburn School serves an area of Leeds where they enjoy enormous parental support; currently there are two first choice applications for every place at Cockburn. Time to bin off these overpaid executive heads and trust heads. They know little of education and are cutting where it matters while they enlarge their already bloated salaries. A bonfire of the executive heads in this country is essential if education is to survive! These (often) bullying gravy train work shy managers need to be removed from the education system. Parents and carers are not aware of the practices in relation to children and staff by these Academies (Trust) senior management.We are a local group of teachers/parents who are fighting against Cockburn School opening a Free School.They raise the attainment of the pupils by getting rid of children who do not meet a certain academic level or special needs.It could be your child next! I couldn’t disagree more with the two comments above, and in particular that of Graham Hunt, who shows no knowledge of the real situation at Cockburn, or in south Leeds. Cockburn, under the present Headteacher and management team, is an extremely successful school achieving recently some of its best results ever. The school is greatly over subscribed, as stated in the article above, to the extent that many local children have been unable to get in. As there is an acute shortage of school places in south Leeds, it is not helpful for Mr. Hunt to try to prevent another secondary school being opened in the area. I know of no cases in the school where pupils with special needs have, in Mr. Hunt’s words, been got rid of. The school is fully inclusive and has a very dedicated special needs department. Similarly the school has a very good mentoring department, there to work with pupils with low attainment levels. I am led to wonder whether Mr. Hunt actually lives in south Leeds, is a parent of a pupil at the school or is employed there as he appears to be so ignorant of the true situation. If not, I cannot see any reason why he and his so called group (which he conveniently neglects to name) should be interfering with the education of south Leeds children. Come on Mr. Hunt, what is the name of your group and how many parents and teachers living and working in south Leeds does it have? I am a parent of a pupil in Year 11 at Cockburn School. My child may not be the brightest but the way he has been supported and stretched by the teachers has been amazing. I agree with the comment above that this Graham Hunt seems to have a skewed view about what happens at this brilliant school. Mr Gurney must have been head teacher for nearly 10 years now and in that time he and his team of dedicated staff have turned the school around. The results they get are amazing and not just for the academic kids. This is why they get such good progress scores from the pupils of all ability. My son is working hard (even in this week for Easter revision with the teachers giving up their holiday time to teach him!) to get a set of grades that should get him to college. I really believe that the Cockburn team will have what it takes to take over this school which has kids from the same streets as Cockburn. Good luck to them all. Why would someone try to block the Cockburn staff opening another school and taking over another school that clearly needs to be better? I left Cockburn two years ago and saw the brilliant job they do first hand. Maybe the guy writing above is one of the teachers who was not good enough to work there? Or one of those people who take pleasure in trolling people who try to do good things because they are jealous? Mr Gurney was always fair and most of the kids in my year were grateful for the fact that the teachers believed in us and wanted us to get really good grades. Surely that is what school is for? I don’t remember anyone being ‘got rid of’. We were supported – all of us. Good luck Cockburn – you will do a great job! I don’t get why you guys are changing the school. My kid loves it just the way it is and she hated to see the new changes. She says that this is not a very good idea and she thinks that this will just make the school worse. This isn’t right. She says that they will not be allowed options and thatd the most worst part. If she wants to choose then let her because she knows what’s best for her. You guys can’t just choose you see. Whys this happening??? I just want to know what’s going on?! ?